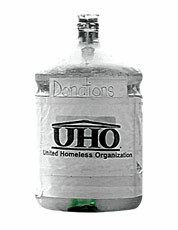 For sixteen years, the United Homeless Organization’s plastic donation jugs have been ubiquitous around town. On November 24, Attorney General Andrew Cuomo sued the group for fraud, accusing its directors—Stephen Riley (UHO’s formerly homeless founder) and Myra Walker—of pocketing thousands of dollars in donations without providing the services they claimed to offer. Meanwhile, with unemployment high and the temperature dropping, other homeless advocates worry the UHO scandal will hurt their work. • About 50 tables around the city per day, each operated by one worker. • Two shifts per day on weekdays; one on weekends. • The tables are grouped into several “clusters” (like Times Square), with one table worker declared the cluster’s manager. • Donations in excess of $15 go to the table workers. • The cluster manager, who collects all the money at the end of a shift, may get a bonus or have his own fee waived if remittances to UHO are high enough. UHO reported revenue between $60,000 and $98,000 from 2003 to 2007, but the A.G.’s office calls that “grossly underreported” and estimates that actual revenues were at least six times as high. • 30% increase in city food-stamp enrollment over the last two years. • 20.8% increase in demand at city food pantries and soup kitchens this year. The recession has hurt homeless-support organizations, reducing charitable donations and government aid. Meanwhile, “We probably haven’t seen these levels of homelessness since the Great Depression,” says Patrick Markee, a senior policy analyst for the Coalition for the Homeless. Markee fears that this case could hurt the image of the city’s dozens of legitimate service providers.